Celebrate the 55th anniversary of the Ferrari 250 GTO sports car with the Thrustmaster Ferrari 250 GTO Wheel Add-On: the limited-edition wheel replica of one of the most famous cars in Ferrari’s rich, 70-year history! This visually stunning 8:10 scale replica measures 13”/33 cm in diameter with a genuine wood finish, metal faceplate and chrome logo plate, and comes in a collector’s gift box with a hot-stamped inner foam display! This authentic replica wheel not only provides a unique, vintage feel in PC games such as Assetto Corsa 1962 250 GTO DLC, but is also a superb collector’s item to proudly display at home. Officially licensed by Ferrari, the wheel is compatible with racing games on PC (Windows 10, 8, 7) with Thrustmaster T-Series servo bases. Officially licensed by Ferrari, the Thrustmaster Ferrari 250 GTO Wheel Add-On is a visually stunning 8:10 scale replica of the real Ferrari 250 GTO wheel. Measuring 13”/33 cm in diameter, this authentic replica wheel not only provides a unique, vintage feel in PC games such as Assetto Corsa 1962 250 GTO DLC, but is also a superb collector’s item to proudly display at home. 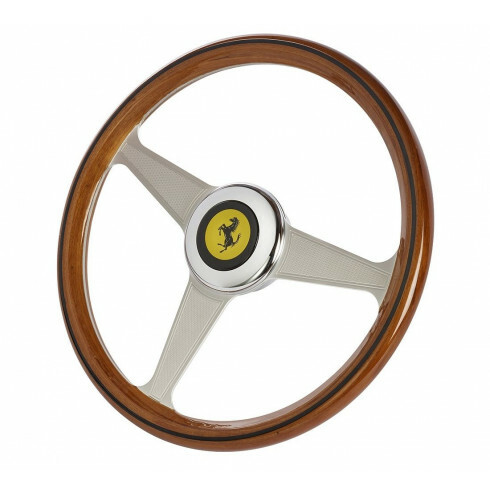 Designed with top-grade materials including a sturdy metal frame (both sides of which are covered with a genuine wood finish), a real chrome logo plate and an eye-catching metal faceplate, this visually stunning 8:10 scale replica (13”/33 cm in diameter) of the Ferrari 250 GTO wheel has been specially crafted for total immersion in Ferrari’s rich, 70-year history. Thanks to the Thrustmaster Quick Release system, the Thrustmaster Ferrari 250 GTO Wheel Add-On is compatible with the following Thrustmaster racing wheels on PC: TS-PC Racer, TS-XW Racer, T-GT, T500 RS, T300 series, TX series; as well as with the TH8A Add-On Shifter.